Home » Internet » How to find blogs to follow or comment on automatically? You might be spending a lot of time trying to find blogs to follow and read daily. You might be looking for a blog that gives you the relevant information to follow daily or a blog where you can comment to get back links or for a blog on a specific or niche topic to gain some information. 1. Go to the Google blog search page. 3. The results would be listed along with options to subscribe to RSS feeds for them. Searching for blogs to follow manually is however very time consuming. Next we look at automating this. You can rather be smart and make this search automatic. 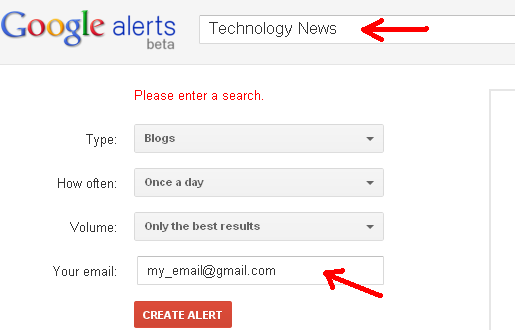 This can be done by using Google Alerts. Enter the search keywords for your blog on top where I have entered “technology News”. Select the type to be “Blogs” as shown above. Decide how often you want emails to be sent to you from Google. Decide if you want the best results or every result. Depending on what your goal is you can select either. If you want to read a blog then you are better off picking the best results only, but if you are looking for new blogs to post comments then you might want to select every result. Finally enter your email address. You can also pick the option of getting feed of results rather then getting emails.